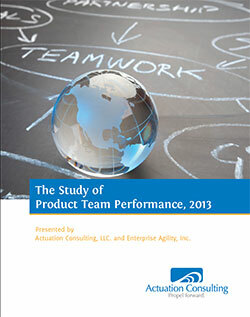 The 2013 Study of Product Team Performance is out! The results are not quite as across-the-board extraordinary as last year’s study – that would have been hard to match – but it offers individual results that are every bit as eye-opening – and overall it’s quite revealing. I thought that was pretty remarkable. I blogged about the 2012 Study’s five factors for success. I also blogged about how the change 2012 survey respondents most wanted to make in their teams rang true in my experience – and how one team had achieved that challenging leap forward. But I was struck by the fact that the 2012 Study’s then-three authors had product and project and requirements backgrounds – but no developer viewpoint. When I pointed that out, they recruited me to be a fourth coauthor of this year’s study. We targeted this year’s study to dig deeper into the factors that affect team performance and product profitability. We partnered with 13 professional associations and companies to recruit and survey almost 1500 members of product teams over 90 days at the beginning of this year. We provided the resulting data to statisticians. Executive Team Support: not only is unwavering executive team support linked with product team success, but so is close connection with the CEO or general manager. The study also revealed four landmines: statistically relevant factors that can undermine a team’s ability to achieve high performance. I’ll blog about some of these results (and at least one other intriguing response) in the next few days here, but you may want to read the 2013 Study of Product Team Performance white paper now.